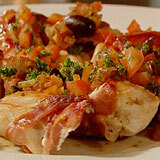 This chicken dish from Mario has wonderful Italian colour, flavour and aroma. 1. Dice the Italian vegetable stuffing so it may fit inside the breast cavity. 2. In the thickest part of each chicken breast, cut a small slit. Divide the stuffing equally amongst each breast and push the vegetables into the cavity. 4. In a heavy based pan on medium heat, add a splash of olive oil and the chicken breasts. 6. Remove chicken from the pan to rest in a warm place. 7. To make the sauce, add diced onion to the same pan and gently fry. Add the remaining sauce ingredients, followed by the balsamic vinegar and water. Stir until the ingredients are softened, warmed through and well combined. 8. Slice the chicken into segments and place on a serving dish. 9. Finally, add a splash of olive oil to the sauce whilst turning up the heat. Briefly allow the oil to combine with the sauce and then serve over the chicken. 10. 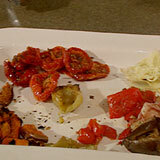 Serve with an Italian style salad and fresh, crusty bread. Serves 4.